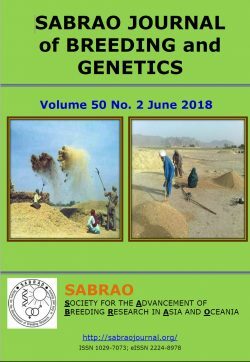 This second issue of SABRAO for 2018 features articles on rice, ground nut, Gandaria; various markers such as RAPD, inter-simple sequence repeat; and different environments such as semi-arid, and drought environments. Perdani AY, Mulyaningsih ES, Paradisa YB (2018). Diversity of some Indonesia local glutinous rice (Oryza sativa L. Var. Glutinous) based on agromorphological and RAPD markers. SABRAO J. Breed. Genet. 50: 85-100. Fatimah S, Ariffin, Ardiarini NR, Kuswanto (2018). Genetic diversity of Madurese Bambara groundnut (Vigna subterranea L. Verdc.) lines based on morphological and RAPD markers. SABRAO J. Breed. Genet. 50: 101-114. Akbar MR, Purwoko BS, Dewi IS, Suwarno WB, Sugiyanta (2018). Agronomic and drought tolerance evaluation of doubled haploid rice breeding lines derived from anther culture. SABRAO J. Breed. Genet. 50: 115-128. Harsono T, Pasaribu N, Sobir, Fitmawati, Prasetya E (2018). Genetic variability and classification of Gandaria (Bouea) in Indonesia based on inter simple sequence repeat (ISSR) markers. SABRAO J. Breed. Genet. 50: 129-144. Asra R, Syamsuardi, Mansyurdin, Witono JR (2018). Genetic diversity in Daemonorops draco (Willd.) Blume (Arecaceae) among wild and cultivated populations inferred by RAPD markers. SABRAO J. Breed. Genet. 50: 145-155. Sari N, Suryadiantina, Daryono BS, Purnomo (2018). Variability and intraspecific classification of Indonesian edible Canna (Canna indica L.) based on RAPD marker analysis. SABRAO J. Breed. Genet. 50: 156-167. Fatonah S, Lestari W, Isda MN, Purba L. (2018). In vitro shoot regeneration of Citrus nobilis Lour. From intact seed and cotyledon explants. SABRAO J. Breed. Genet. 50: 168-179. Khuimphukhieo I, Khaengkhan P (2018). Combining ability and heterosis of sesamin and sesamolin content in sesame. SABRAO J. Breed. Genet. 50: 180-191. Dwivedi SK, Kumar G, Basu S, Kumar S, Rao KK, Choudhary AK (2018). Physiological and molecular aspects of heat tolerance in wheat. SABRAO J. Breed. Genet. 50: 192-216. Hegde VS, Tripathi S, Bharadwaj C, Agrawal PK, Choudhary AK (2018). Genetics and genomics approaches to enhance adaptation and yield of chickpea (Cicer arietinum L.) in semi-arid environments. SABRAO J. Breed. Genet. 50: 217-241.